In my quest to find the most useful virtualisation software for Mac I've so far used Parallels Desktop, VMware Fusion and Q.app in various capacities. Today I decided to take a closer look at VirtualBox, the free and open source virtualisation software by Sun Microsystems. Firstly the good news: VirtualBox is fast. Because it can take advantage of VT-x in the Intel processors of modern Macs the performance is in an entirely different league to QEMU based applications and much closer in performance to expensive (at least in the eyes of a university student!) commercial products from VMware and Parallels. Because of it's higher performance, VirtualBox can run all current flavours of BSD, Linux and Windows that I've thrown at it just beautifully. 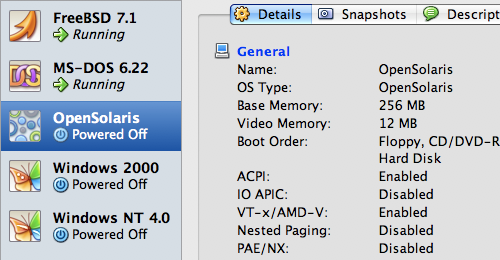 Creating machines is a snap, and the shortcut keys for commands such as hard reset (command-R) are the best of any Mac virtualisation product I've used. Unfortunately for me there have been some problems. For starters, considering it's a Sun product I found it disheartening to find OpenSolaris 08.11 can't pass the initial boot stage to install without giving an error which is a shame. FreeBSD has difficulty using the emulated optical drive which in practical usage is fine but it means you need to initally install over a network, no easy install of an ISO is possible. And for my electronic nostalgia, VirtualBox crashes whenever I attempt to load either the EMM386 or UMBCPI upper memory managers in MS-DOS 6.22 or PC DOS 2000 despite exhaustive attempts to map the correct memory addresses. As I said on my Q.app review, my first generation Core Duo MacBook Pro seems to be a very quirky machine for virtualisation: it seems to have troubles than most Apple people don't seem to have! Keeping this in mind I'm ready to chalk these problems up to my eccentric machine, but it's still a bit disheartening. VirtualBox has the potential to be an amazing product, and certainly for Windows and Linux it does the job beautifully — especially for the price! Unfortunately for my own current needs though I'm going to have to give it a pass; while it does run Windows 2000 amazingly well I'd prefer not to have to use several higher end virtualisation products for different things.